Our rooms and suites come with a FREE FULL HOT BREAKFAST. Relax in the heated year-round pool and indoor spa or workout in our exercise room. 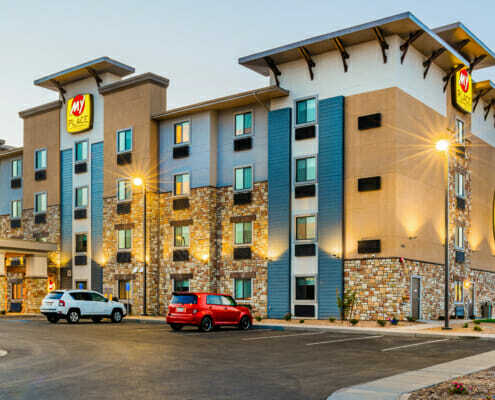 Each room comes with a 42" flat panel television, refrigerator, microwave, iron and board, cable television, HBO, plush Serta Mattresses and free high speed internet. We also have meeting rooms, award winning catering and a business center. Best Western Coral Hills- "All golf courses are only minutes away from our hotel. We’re located in the beautiful historic district within 2 blocks of 7 restaurants and shopping. Each room includes: microwave, refrigerator, cable TV, Free Hi-Speed Internet, and voice mail. 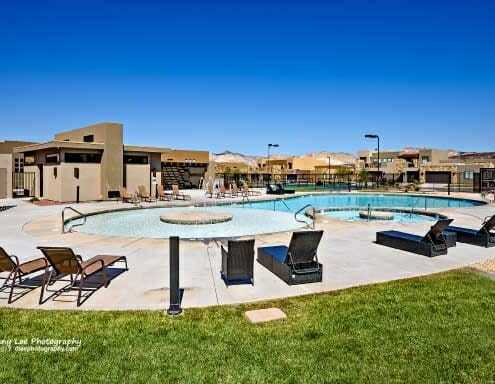 Indoor and outdoor pool and spas, exercise room, guest laundry, airport shuttle & Complimentary Deluxe Hot Breakfast." 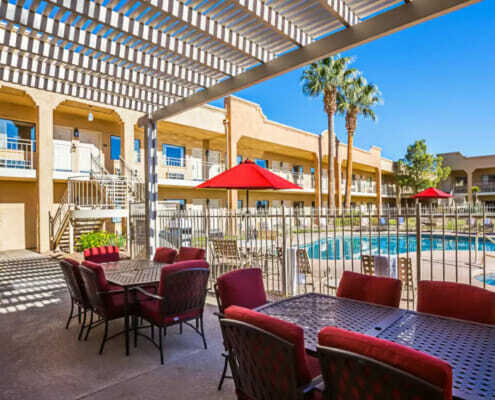 The Clarion Suites, an eight time award winning platinum hotel, with close proximity to 24-hour restaurants, shopping and I-15. Complimentary full breakfast, pool and hot tub. All mini suites have a microwave, refrigerator, full size ironing board/iron and coffee maker. HBO with Movie/Nintendo rentals available. Enjoy fresh, hot cookies at check-in! Golf courses are conveniently located. Our luxurious rooms are the finest in the area and come with a FREE FULL BREAKFAST. Relax in the heated year-round pool and indoor spa or workout in our exercise room. Rooms have a refrigerator, microwave, iron and board, over 80 television channels, plush Serta Mattresses and free WiFi. Located right off I-15 at Exit 8. Across from Zion Factory Stores and the Promenade at Red Cliff. 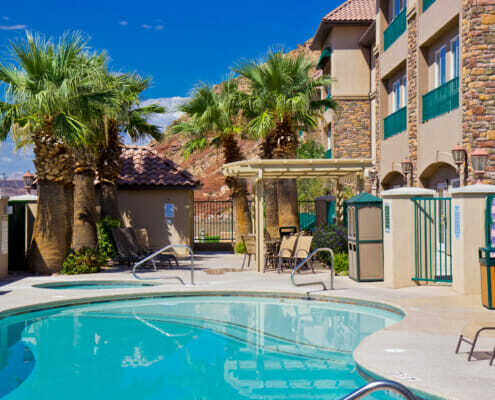 Surrounded by the natural beauty of Southern Utah, the Hilton Garden Inn St. George hotel offers a great location for our many beautiful golf courses. After a day of exhilarating golf, delight in knowing that every spacious guest room and suite at the Hilton Garden is fully equipped with modern conveniences to ensure you enjoy your stay. Enjoy delicious food and cocktails, or, just a cocktail! It’s your choice at our onsite bar called "The Office Lounge". St. George Holiday Inn Hotel is the premier destination for your golfing experience in Southern Utah. Take advantage of our on site restaurant: Burger Theory! Serving the best gourmet burgers in town. Take in the breathtaking view of historic downtown right from your large window in the comfort of your room. Gather with friends and enjoy our patio with an inviting fireplace. The perfect ending to a great day of golf! This property features a pool surrounded by palm trees and raised garden banks that perfectly complement the radiant red-rock bluff setting of St. George. Personal service and premium amenities are a plus here! Recreational activities such as hiking, mountain biking and golfing, are within easy reach of this entirely non-smoking St. George hotel. Wake up each morning to a hot, deluxe breakfast before you hit the links. The Ledges offers vacation rentals where guests have the ability to stay onsite in homes and luxury villas managed by Ledges Vacation Rentals. The vacation rental units vary in size and accommodations to fit the needs of any group including couples, adult retreats, family vacations and golf groups. Rates start as low as $199 per night and have a maximum occupancy of up to 14 people per unit. 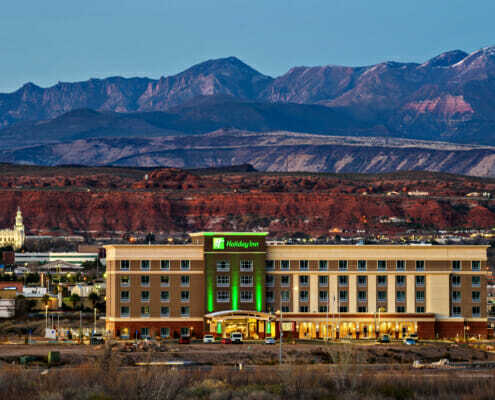 The Quality Inn® Washington – St George North hotel is near the St. George Temple, Quail Creek State Park and Snow Canyon State Park gives you more value for your hard-earned money. 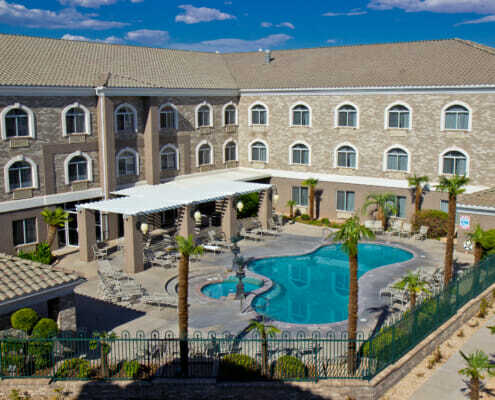 Our convenient location off Interstate 15 in Utah’s Sun Belt makes this Washington hotel your ideal lodging destination. From premium bedding and a refreshing shower to hot breakfast and friendly service, it all adds up to real value for you. Relax in your guest room, which features a flat-screen TV, refrigerator, microwave, coffee maker, desk, hair dryer, iron and ironing board. Your Q Bed features a comfortable, premium mattress and linens, a generous supply of fluffy pillows and a soft, plush blanket–because we know you value a good night‘s sleep. 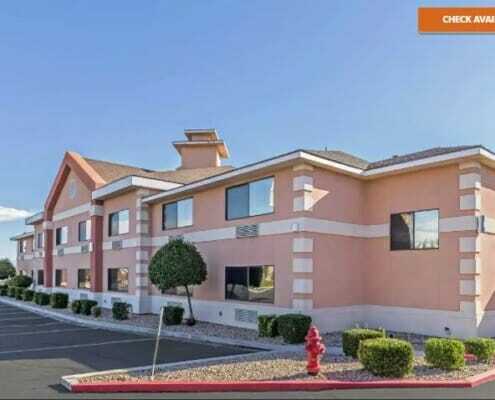 Get your money’s worth at our Quality Inn Washington – St George North. Red Rock Vacation Rentals is proud to offer our 5-star performance rated properties to destination golf groups. Don’t take our word for it of why we are the best value, see why our travel partners refer to us as “Super Host Airbnb” managers and “Premier Partners” on VRBO. Both titles are equivalent to 5-star hotel ratings but were designed specifically for the Vacation Rental industry to recognize the top properties in the industry and in our local area. Got 2 seconds? Check us out on Google Reviews and see what our guests have to say! 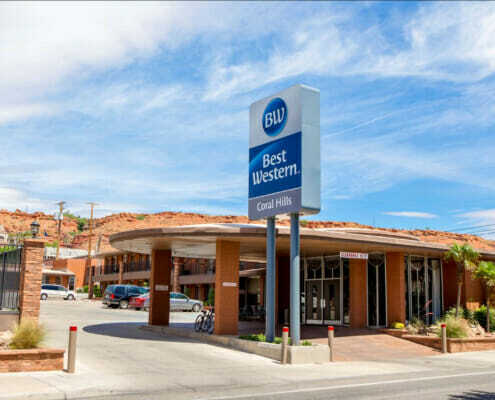 Sand Hollow Resort guests are in the center of all Southern Utah has to offer. And, if spending time with friends and family are essential to building a memorable experience, the Vacation Villas are perfect for you. Overlooking the Championship Course’s front nine, the views extend from Pine Mountain to Zion National Park. Available for a quick overnight retreat, or long-term stay, the fully furnished villas are much more than the average hotel room. Each unit varies from one to six bedrooms. Conveniently located near restaurants, shopping, and movie theaters and only 15 minutes from many of southern Utah‘s championship golf courses. Many rooms have Jacuzzi tubs, kitchenettes, and coffee makers. 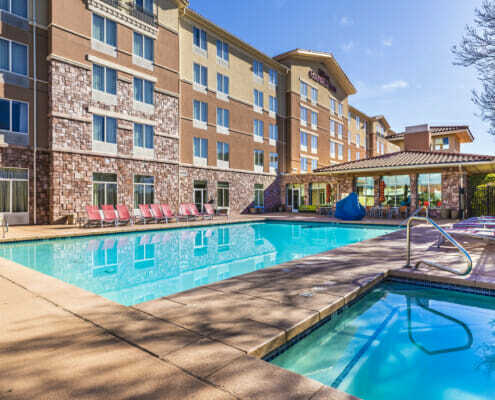 You’ll also enjoy two pools and Jacuzzis (indoor and out), adult fitness center, free full breakfast, in-lobby coffee, tea and hot chocolate and guest laundry facilities. 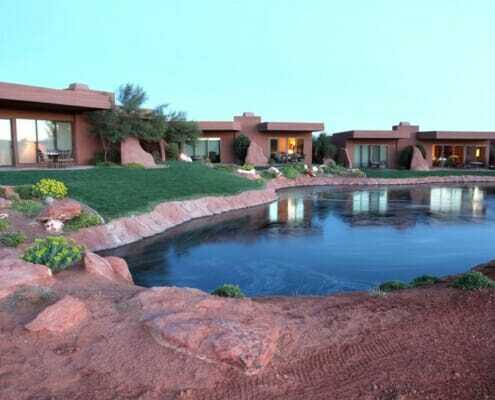 The Inn at Entrada is a small, luxury resort inside a gated golf community in St. George, Utah, that features luxury casitas with panoramic views of striking, red vermilion cliffs. This desert paradise is nestled near the mouth of southern Utah’s breathtaking Snow Canyon State Park. Whether you’re interested in playing golf at Entrada or other nearby golf courses, experiencing Broadway in the desert at Tuacahn Outdoor Theatre, sightseeing in nearby Zion National Park, or soaking up the sun by the resort pool while enjoying the beauty of the red rock country. Your stay at The Inn at Entrada will give you magical memories. 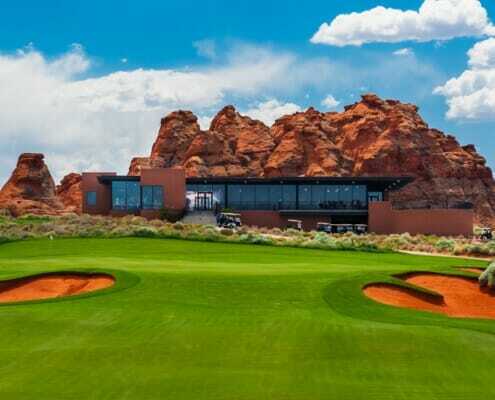 With Golf Digest’s number-one-ranked, year-round golf course in Utah, Entrada’s course is one of CNN’s 19 epic golf courses to play before you die.